Dave's Part: Iraq: what is to be done? Iraq: what is to be done? The terrible news just in that at least 132 people have been killed in a series of car bombs in Shia districts of Baghdad. Greater or lesser atrocities such as this are now happening on a daily basis. What is now happening in Iraq underlines the political inadequacy of the positions the main camps on the left adopted over the conflict three years ago. It is increasingly obvious that both the pro-war left – remember their visions of a grateful Iraqi people strewing the path of US troops with flowers? – and the ‘Victory to the Resistance!’ brigade have gotten things completely wrong. Not that either can bring themselves to admit it, of course. The project that movitated the invasion has clearly failed, albeit in ways I don’t think anybody anticipated at the time. It has created a crisis without any obvious solution. The inability of the occupation troops to achieve order in Iraq underlines that the power to destroy is not the same as the power to create. 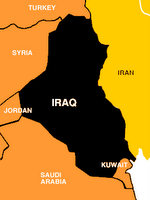 The occupiers cannot build a state in Iraq, because they have no legitimacy. Iraq’s weak government can claim to issue from a broadly democratic election, however warped the process was a result of being held against the backdrop of an occupation. But inevitably it also lacks legitimacy, largely because the very concept of ‘Iraq’ itself lacks legitimacy, or even logic. It is an imperialist construct, which has existed for just 80 years of Mesopotamia’s 8,000-year history. The Kurds want their own homeland, the oil-rich Shias look to Iran. The Sunnis have neither oil nor a majority, just guns and a willingness to use them. One idea doing the rounds in foreign policy circles is some loose federal framework, with everything open to negotiation: the division of oil, water, and access to the sea. Superficially, it seems an attractive proposition. But it runs up against many of the problems experienced in the partition of Ireland or of India and Pakistan. The distribution of populations does not correspond to neat lines on a map. Even more bloodshed would inevitably ensue. The move would also be unpopular in the Middle East. Many Arabs would regard it as Zionist plot to fragment Iraq for Israel’s benefit. And there is no way the US would countenance the creation of a Sunni-dominated de facto Al Qa’eda statelet. So the slaughter looks set to continue for years, whether the occupation forces remain or not. I opposed the war in 2003. Nothing that has happened in the intervening period has given me reason to reconsider that opposition. And given that it was a mistake to wage the war in the first place, rapid withdrawal of occupation troops seems the least worst option.